Natori Moore's Soul Food Astrology - Stellar Recipes for Good Living! San Diego astrologer Natori Moore, C.A. NCGR offers astrological articles, services, and a monthly forecast. 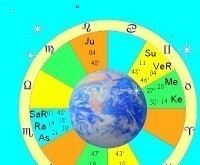 Official site of top horoscope columnist Eric Francis. In-depth horoscopes and gorgeous artwork plus hot writing on astrology, world news, the environment and sexuality. Eric is an investigative journalist, counselling astrologer and Chiron specialist. Starguide by Carol Cilliers free weekly and monthly horoscopes at CarolCilliers.com (formerly Starguidebycarol.com). Private astrological and clairvoyant readings and rebirthing sessions. Classes and workshops in psychic development, meditation, yoga, belly dancing, free healing clinic. San Francisco Bay Area. Welcome to my astrological site. You will likely perceive that I practice a humanistic astrology that points you into the future with empowerment and inspiration! As your eyes start to scan what follows, it is my intention to get them to open wider and wider. We use the latest technology to ensure accuracy, and we are committed to your success. We can guide you to discover joy, power and peace in your life! Living in Harmony with the Astrological Cycles. To educate the minds and hearts of people in every land in ways that evoke Right Human Relations. If you have a serious, perhaps urgent problem to resolve, whether it be concerning money, bad luck, love or any other large or small grievance, to help you, I am offering you a Free Clairvoyance Horoscope and I will reveal your lucky numbers, all free of charge. Back to the category "Astrology"